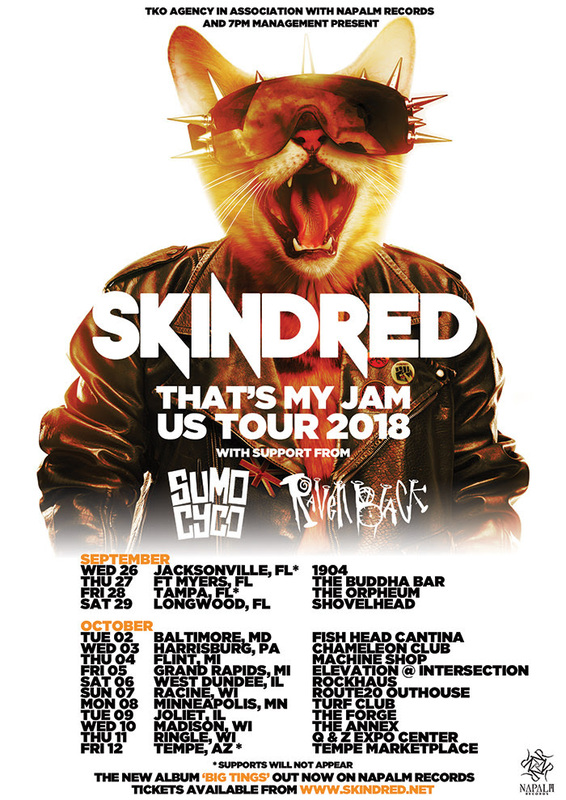 Ragga Punks Skindred have announced their return to North America in support of their new album “Big Tings”, which features the active rock radio smash ‘That’s My Jam’– #22 on the charts this week. The tour kicks offSeptember 26th in Jacksonville, FL and runs through October 12th in Tempe, AZ. A complete list of dates can be found below. Support on the tour will come from Sumo Cyco and Raven Black. “Big Tings” the follow-up to 2015`s “Volume”, is a magnificent beast churning out heavy, distortion-laden riff punches melting into vocalist Benji Webbe`s frenzied rapping. Explosive rock, metal and punk material rubs shoulders with smooth melodies – and of course Skindred wouldn`t leave us on the dance floor without a hefty helping of their trademark Godzilla-huge choruses. Big songs, big sound, “Big Tings”!